The official start of summer may be another month away but I’m getting ready for it now. With a stash of fruit-herb sorbets in the freezer and dinner from the grill, I’m looking forward to leisurely dinners sitting on the deck sipping some chilled wine and lingering at the table visiting with my family. Being outside, our Texas mosquitos would devour us in 5 minutes if the heat doesn’t get to us first and my kids rarely want to linger at the dinner table. A girl can dream though, right? In reality, our dinners are sometimes rush jobs to get everyone together in the short window of time when our schedules overlap. However, that doesn’t mean we can’t have a delicious homemade meal together that everyone enjoys. These Asian grilled shrimp skewers with grilled mangos fit the bill perfectly. 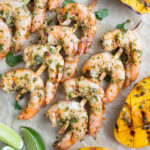 Shrimp and mango on the grill take less than 10 minutes to cook and you can make the marinade ahead of time to cut down on prep work at dinner. The base for the marinade is my favorite flavor combination of fish sauce, sugar, and lime juice. Then fresh herbs, shallots, and garlic get added to liven it up. The shrimp don’t require a long marinating time to soak up the flavors plus an extra brushing of marinade at the end of cooking ensures there will be plenty of seasoning still on the shrimp when you take it off the grill. When it comes to wooden skewers, I am a big fan of the wide flat ones rather the typical thin, round ones. The wider surface area grips food better making it easier to flip the shrimp skewers over. Given the relatively short cooking time of the shrimp, I find I don’t even need to soak the skewers in water before using them. Make sure your grill is very hot when you put the mango on. Otherwise, you will end up with just warm mango rather than grilled mango with some nice char. No matter what kind of time you have for dinners this summer, let these Asian grilled shrimp skewers be part of your plans. You won’t be disappointed. In a medium bowl, whisk all the marinade ingredients together until evenly mixed. In a large bowl, add the shrimp and drizzle with 3 tablespoons of the marinade. Toss to coat the shrimp evenly. Reserve the remaining marinade for brushing on the mangos and grilled shrimp. Let the shrimp sit at room temperature for 15 minutes while preparing the mangos. Remove the flesh from the mangos by cutting lengthwise, slightly off center, down the wide sides of the mangos avoiding the seed in the center (you’ll have some flesh left on the mango seeds which you can snack on). You should end up with 4 large mango slices. Score the flesh of each slice in a diamond pattern being careful to not cut through the skin. Set aside. Thread shrimp onto skewers and lightly brush each side with some oil. Brush some marinade onto the scored side of the mango slices. Lay shrimp skewers and mangos (cut side down) on grill. Cook shrimp (turning once) until they are bright pink and just opaque in center, 4 to 6 minutes total. Brush shrimp on both sides with reserved marinade during the last minute of cooking. Cook mangos until slightly charred and grill marks appear, about 5 minutes.